It's hard to believe that soon, my little guy will have been here for two months. With his early arrival, I am still playing catch up to the long list of items that were pushed to the back burner upon Liam's 37 weeks delivery. One of those items being birth announcements. By now, most of my family knows that I have given birth. Obivously. I'm an over-sharer, so I am sure they have seen pictures of Liam plastered on one of the social networks I frequent. And if you are reading this post, you've probably read a few others detailing the birth of him. 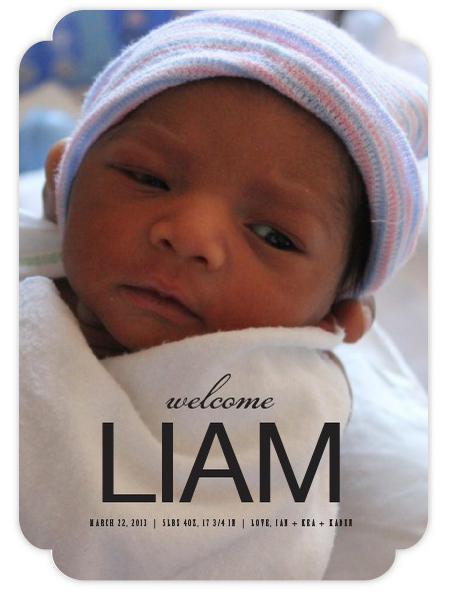 Either way, Liam's birth has been announced. However, I wanted to formally introduce him to the world. I thought it would be perfect, and much easier, to send out a birth announcement that would also doubled as a thank you card for those who gave gifts at my baby shower. I'm going for the whole two birds, one stone thing. You feel me?! I've been known to personalize my gifts over the years. To me, they add value and show the recipient that you took the time to create something special just for them. It also increases your chances of not having your item tossed in the trash. Maybe. 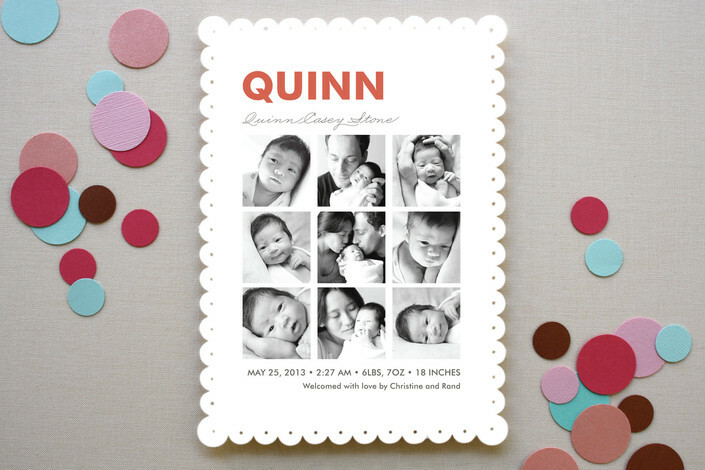 What I like most about the Minted birth announcements is the option to personalize. Most of the cards can be redesigned to change the orientation, shape, style, paper type and color. So, if you are one for adding your own special touch, this is a great way to still have a bit of control. I'll admit, I have spent way too much time on the site. It's so fun creating cards and visualizing the look on the recipient's face when they open it. Makes all the not-so-hard work creating the card all worth it. 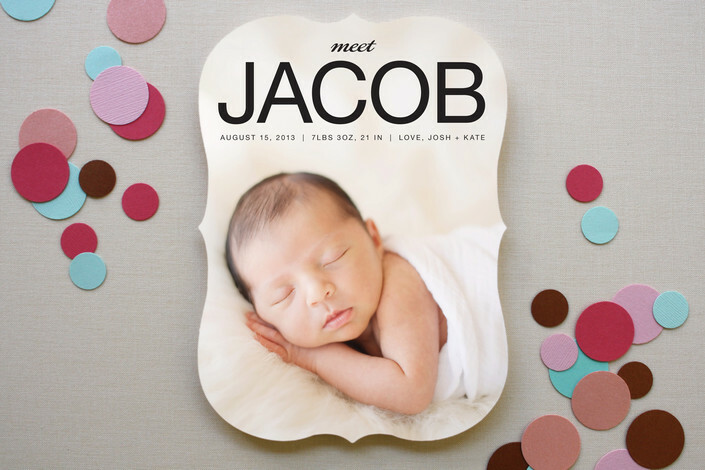 I like the simplicity of the Meet Jacob birth announcement. I chose to make it a folded card so that I could write a message inside as well. There is also an option to include more pictures. Believe me, I have tons of those available. Here is a sample of the card I made. This is not what I ordered. I'll have to play around with my options more. The price per card isn't so bad, but when you multiply each one by the amount of shower guests you had, it adds up quickly. Make sure they're worth it. Hehe!! I just wanted to give you an idea. 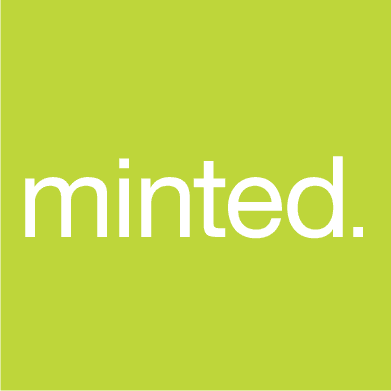 Compensation was in the form of product and a credit to the Minted.com site. There was no monetary compensation involved. All opinions and views are my own.